Edward Lear, Hajar Kim, Krendy, Malta, 4 March 1866. 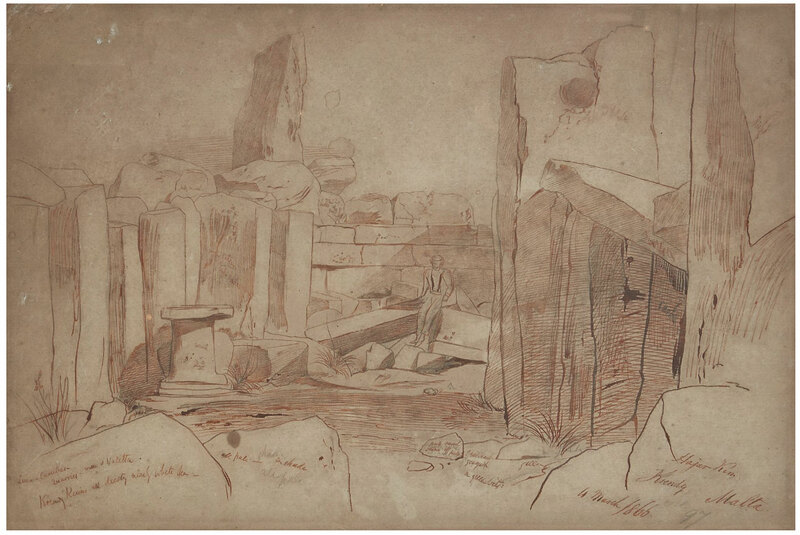 Annotated sketch at the archaeoligical site of the prehistorical temple complex at Hagar Qim, near Qrendi in southern Malta, pen and sepia ink over pencil on buff paper, 360 x 525mm., annotated in the lower half with location and colour references in the same ink, evenly browned, 1866. This is a companion drawing in respect of exact date, subject location, paper type and annotation, to no. 973 in the catalogue of the collection of Edward Lear landscape drawings in the Houghton Library of Harvard University. Edward Lear (1812-1888) visited Malta for the penultimate time between December, 1865, and April, 1866, the longest of eight spells on the island, stopping there again only very briefly in December 1866, on his way to Egypt. Despite these numerous returns to Malta, Lear was ambivalent towards the place, as expressed in a letter to his sister, in 1848, “I cannot remember to have left any place with so much regret after so short a stay in it. But I could not live at Malta ― there is hardly a bit of green in the whole island ― a hot sandstone, wall, & bright white houses are all you can see from the highest places”. The megalithic temple complex of Hagar Qim, in the south of the island, dates from 3600-3200 BC, and is considered to be one of the oldest religious sites on Earth. It was first excavated in 1839, and is now a World Heritage Site. Provenance: with Antoine Xuereb, London. This entry was posted in Edward Lear and tagged Edward Lear, landscape, Malta, travel. Bookmark the permalink.